A top aesthetic surgery clinic in Taiwan has received a stylish and innovative, interior healthcare design ‘facelift’ thanks to the use of two DuPont performance materials: DuPont™ SentryGlas® Expressions™ decorative laminated glass and Corian® solid surface. 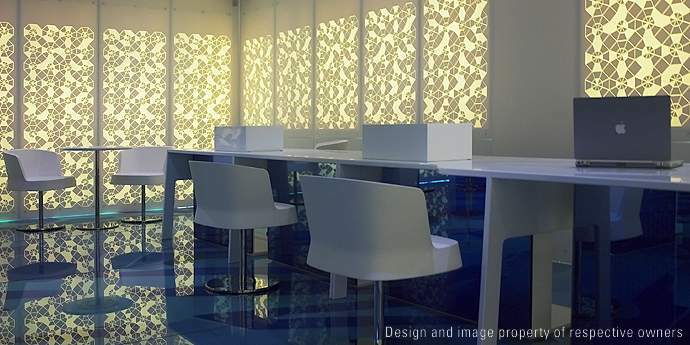 Translucent Wall Panels made with Corian® Provide Design Versatility. The retro-fit was completed by well-known British designer Michael Young, his artist wife Katrin Pétursdottir Young and their Taiwan-based team in February 2005. True to form, Young’s team of architects and designers used these two DuPont Performance Materials in some new unique new ways. The floor, doors, interior walls and self-standing partition walls of the clinic’s reception area are made of laminated glass incorporating SentryGlas® Expressions™ decorative glass technology and were based on a purple and blue design by Katrin Pétursdottir Young. 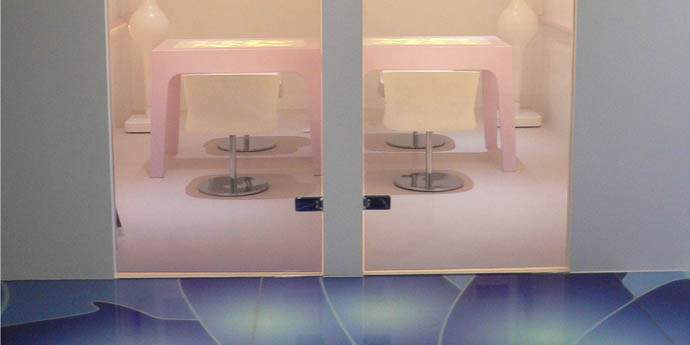 Some of the glass partitions feature a purple colour gradient on a mirrored backing, marking the first time colour gradients and mirrors were used in conjunction with the decorative glass technology. It is also the first time SentryGlas® Expressions™ technology had been used for a laminated glass floor. Laminated glass incorporating SentryGlas® Expressions™ decorative glass technology was also used for glass partitions and doors, testing various gentle colour gradients on a mirrored backing that would make discreet partitions between different meeting rooms. The glass laminator for this project was Stanley Glass of Taipei City. Corian® solid surfaces meet virtually any size requirements and can be carved, backlit and thermoformed into most any design – offering flexibility unmatched by any other surface material. Michael Young was enthusiastic about the use of Corian® solid surface in the clinic’s retro-fit. He said: “Working with Corian® solid surface adds a new dimension to traditional surfaces – it allows us to work with a new design freedom; so much so that Corian® solid surface really feels like a 3D material to me.” Corian® solid surface can be formed into virtually any shape or design that a designer can master-mind, whether it’s a softly-rounded ergonomic table corner, an intricately-carved, decorative pillar or a 20-foot long reception desk. Young continued: “Using Corian® solid surface in a medical environment gave us the opportunity to use the solid surface material to its full advantage. In addition to its outstanding aesthetic properties, cleanliness is vitally important in healthcare design. Because it is nonporous and highly durable, Corian® solid surface is ideal for use in healthcare clinics, while blending in well with other new design materials such as SentryGlas® Expressions™ decorative laminated glass technology. The combination of these two materials enhances the futuristic image of Dr. Chang’s refurbished clinic while creating a more pleasant and efficient working environment. “Another important reason we wanted to use Corian® solid surface in the clinic was the introduction of new digital techniques for the solid surface such as Computer Numeric Controlling (CNC) milling – a sort of digital carving that allows custom patterns - and luminosity. We believe that this is the first time that CNC milling has been used with Corian® solid surface in the Asia Pacific region. Corian® solid surface has a unique translucency that gives the material an extra dimension when light is added and makes it an ideal choice for lighting designs. Young added: “We used Corian® solid surface on all of the clinic’s cabinets, in the operating room, wall rails boards or wall rails, and in the skirting boards / wall rails in the clinic’s corridors. We also used Corian® solid surface in the kitchen and bathroom surfaces – even for picture frames throughout the clinic! We used CNC Corian® solid surface for table top inserts in the consultation room; these are also back-lit, and therefore very luminous and attractive.” The doors, sills and wall rails were fashioned out of 6-mm thick Corian® solid surface material to enhance translucency, while the other applications listed use 12 mm-thicknesses of the solid surface material.